Dark Brown Henna Beard Dye: It's a weekend and you see those stubborn grey hair in your beard, side burns and hair, you wonder should I dye those with boxed dyes and go through all the burning, itching & annoying fumes, but then you give up the idea to color your hair. Now you don't have to, because our all natural, raw, vegan and gluten-free hair dyes are a gift from heaven, for every man who is allergic to chemical hair dyes, and whoever wants to be pro-active and want to enjoy countless hair health benefits by switching to plant-based hair dyes. All of our shades are made by using organic ingredients i.e henna, indigo, amla, false daisy, red clay, hibiscus powder etc. We use finest quality of each ingredient and triple sift powders for the perfect non-clumpsy pastes. We ensure each ingredient is fresh to maximize the results. When it comes to henna or natural hair dyes, there are plenty of brands out there, but quality & integerity is all that we care about, you would think that all henna is same so what difference does it make when you chose one brand or the other, but it actually makes a huge difference. 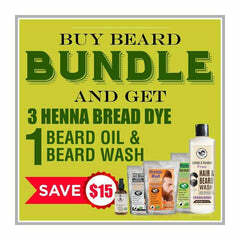 Here is why our Dark Brown Henna For Beard is highly reviewed and hot natural beard dye. ✓ Always a fresh and potent batch ✓ Manufactured in GMP & ISO certified facility. Your order of dark brown will come containing below contents, if any of these are missing from your kit, let us know and we will replace it for free. Dark brown is best used when using two step process. Its a little lenghty process but totaly worth the hassle. we back our product completely and provide full refunds & free products until satisfied. Henna (Lawsonia inermis): This bright red hue powder is made from the leaves of henna plants. In addition to acting as the color base, this ingredient also provides the hair with superb conditioning power. Indigo (Indigofera tinctoria): Indigo powder is a blue toned ingredient that is made by a plant. When mixed with the red tones of henna, it can provide a range of dark browns and blacks depending on the ratio of the two powders. Dark brown henna hair dye is available due to the combination of this important ingredient with henna. Amla (Phyllanthus emblica): In order to darken and help elongate the color, we add in amla. This special ingredient comes from the Indian gooseberry and makes the henna hair dye process more valuable. False Daisy (Eclipta alba): False daisy helps enhance the henna hair dye effect by adding gloss and revitalizing the hair with its repairing and reconstructive properties. Rose Mallow (Hibiscus rosa sinersis): To help add strengthening effects within the henna hair dye, we add in rose mallow. This herb also has special cleansing properties so that the end result is shiny and silky hair. Neem (Azadirachta indica): Naturally deep condition your hair and scalp as the henna hair dye is working its color magic on you. Neem provides condition properties that can improve the overall look and feel of your hair. This is the best beard dye I have ever used. The color is truly amazing and it lasts longer than many dyes offered by other brands. If you also want to enjoy a natural looking color, this Henna Guys dye is an amazing choice. I’ve been using products from henna guys for 2 months. I must say they have excelled in the quality of their products. Dark brown henna is another good quality product. Cost is very economical and shipping is always on time. I’m glad about my decision of using this product. It has given the perfect color to my beard! My dry hair has become smooth and silky. Rough ends have disappeared. Completely satisfied. So natural look! I’m so happy with the texture of this dark brown henna beard dye. When I went outside after using it to meet my friends, all questioned about what dye I used! My beard was looking so fresh and radiant, above all, natural. Excellent quality, good aroma which I liked personally. The dark brown color looks really natural on my beard! It also conditioned them and didn’t cause any irritation on my skin.